As we’ve seen recently with The Dark Tower (2017), adapting Stephen King to the big screen can be a perilous proposition. The renowned horror author’s works are often thick tomes, littered with rich detail that enliven the world and characters he creates. When bringing that to film, it can often be a fine line to walk. Too much, and the film appears overstuffed and leaden, too little and…well, you get dross like The Dark Tower. As one of the author’s most popular books, with an already beloved TV miniseries adaptation from the 90s, It was a risky proposition. Can Pennywise put the fear of clowns into a whole new generation of viewers? During the summer of 1989 the town of Derry, Maine is plagued by a spate of child disappearances. Something that fits all too well with the dark past of the town. Haunted by the disappearance of his brother, Bill Denbrough (Jaeden Lieberher) and his group of misfit friends (known as the “Losers Club”) search for the answers. They themselves are often terrified by waking nightmares, that all feature the same central figure of a disturbed clown -the frightful Pennywise (Bill Skarsgård). This version of It works, because it is willing to give the story room to breathe. At over 2 hours, that is a fair amount of room, but this allows for a lot of character development, interaction and moments that director Andy Muschietti (Mama) used to good advantage. Here he is aided by a cast that has a lot of chemistry with each other, and substantive charisma on film. The “Losers Club”, are a collection of likeable kids, and as an audience we don’t mind spending time with them – be that enjoying a summer swim, running from bullies, or tangling with an extra-dimensional demon in the shape of a terrifying clown. 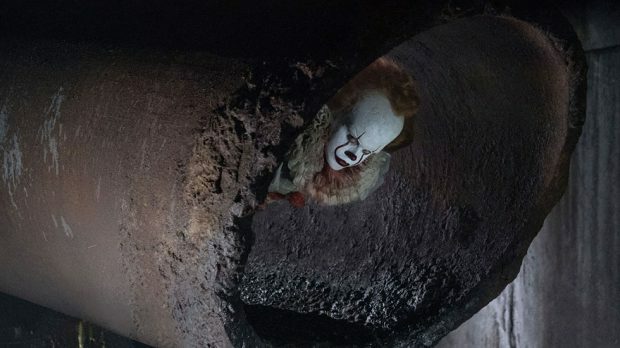 Of course that terrifying clown is the centre of It, the bedrock that the film rests upon. Skarsgård will be giving people coulrophobia for decades after this. Somehow the actor manages to pull off the unique trick of still being fearful, while wearing a frilled neck ruff. His intense stare, eerie cadence and rat like prosthetic teeth are sheer nightmare fodder. Which is really the beauty of It as a story. It is able to take those childhood fears, and meld it into a cohesive whole, that is more solid and chilling for it. Fear is a universal constant, something we can all relate to at some point, and this explores facing those personal demons and overcoming them (albeit in a more literal form than we will ever experience). It also manages to cleave closely enough to the novel, but not to be a literal translation of it. There is a change to the time setting (with 1989 setting being a few years after the original novel’s release date), some of the events are different, and it jettisons some of the more mythological elements, but the broad strokes bear a close enough resemblance for the script to work. The most noticeable difference is that unlike the novel, It is only set in one time period, dealing with the event that take place in the protagonists’ childhood, rather than them as adults (although a sequel is planned). Hence It plays like a King recollection of youth (Stand By Me), but through the retro lens of Speilberg’s 80s, rather than that of the 50s-60s. It manages the right balance of horror and youthful nostalgia. Although there are certainly scares here, it never takes overwhelms the story that is being told, giving us something that is creepy but exhilarating. As such, It manages to achieve something that only a handful of films have done before – a good Stephen King adaptation.